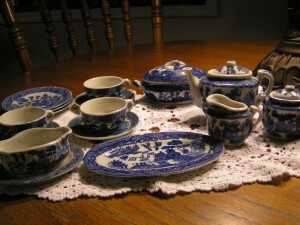 This is a china Blue Willow tea set I got when I think I was about 6 years old. On the bottom it is marked Made in Japan. My Granny got it for me. My sister Karen (It) and I have had so many good times drinking tea and eating cut up pieces of toast when we were growing up. Tonight on Facebook somebody was talking about having a set of these growing up and it made me think of mine. I took them out of the china cabinet and made the picture. I hope you enjoy. I may have some tea and toast later on. This entry was posted in Blast from the past., Main. Bookmark the permalink. Oh my gosh…my eyes are misty…I also had a set exactly like that! It is so wonderful that you have such a complete set as I only have a couple of pieces left. I recall them being shared with neighbors once I “outgrew” them and many were lost. Thank you so much for sharing and taking me back to my childhood…I can still see the dishes arranged on my little oak table & chairs set.